CoolWare Personal Cooling System Keeps You Comfortable Running Man Style | OhGizmo! 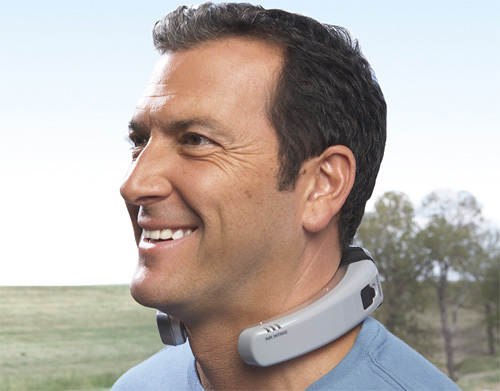 Instead of exploding and decapitating you if you attempt to escape a prisoner work camp like in the film The Running Man, this slightly more pleasant collar from The Sharper Image ($49.99) promises to serve as a personal air conditioner on those days when the sun’s working a little too well. Summer season this cooling sensation is very useful for all.. Because it gives refreshes our entire body.. Thanks for this update..
All of my readers always make my day with their wit and insight! I had one of these from the old Sharper Image and it worked well, except during periods of high humidity. I would recommend it to anybody and will buy another soon. Wasn’t that actually the Christophe Lambert film Fortress?